Kerala fish mulakittath / red hot fish curry is one of the common dish prepared for lunch in most of the houses in Kerala. This is a spicy hot fish curry without coconut. Nadan fish curry / Kerala fish curry is the traditional dish of Kerala which is spicy, hot and tangy. 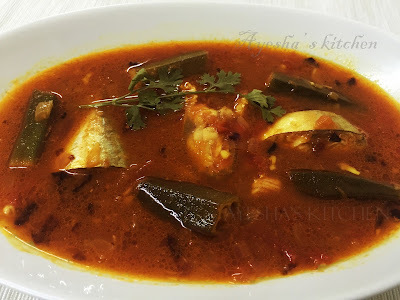 When I was at my home in Kerala, my mom used to prepare this special fish curry for lunch. And if the fish is unavailable she used to make okra curry the same way. The juicy lady's finger in fish curry tastes really awesome and we used to add more lady's finger for the same. Do try this Kerala fish curry recipe along with hot steamed rice and have a delectable lunch meal. Heat oil in a clay pot or non-stick vessel. Splutter fenugreek and then add sliced onions. Saute for a while and add ginger garlic crushed, green chilies and salt. Saute well and add curry leaves. When the onion is done, add the chopped tomato and close the lid. Let it cook for few minutes. Now add chili powder, coriander powder and turmeric powder. Saute well and cook for a while. Then add the lady's finger and cook for other few minutes. Then pour the tamarind water and add required salt. Cook for few minutes until the oil floats on the top. Stir well and now add the cleaned fish pieces and makes the flame to low. Cook for another 5 - 8 minutes. Heat oil in a pan and fry 1 tsp chopped small onions and curry leaves.